Santa Cruz Body Wraps and SKIN CARE. Anti-sagging, firming body wrap, using YonKa Body Products to tone, lift & tighten skin. 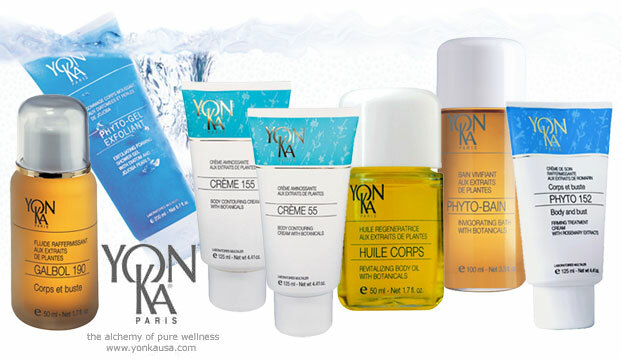 Finally, a true "anti-sagging body booster" YonKa's Phyto Fermete! The star ingredient is ROSEMARY: this extreme firming agent is reinforced with hops, eucalyptus, sage and horsetail, beech buds, silicon & Vitamin E, to energize, stimulate & restructure the epidermis. Provides an incredible "lifting" effect for the entire body, reshaping with firmer, denser skin feeling smooth and soft. Full treatment includes "Gayle's Firming Facial" using one of the Bio-Therapeutics' tools and unique products to firm, lift & tone the face. This is a 2 hour 15 min Treatment total for the Body & Face. Initially the facial with steam begins followed by warm compress Foot Massage. Next is full body Gommage to completely exfoliate the skin with European dry brushing technique followed by deep tissue massage using Phyto 152, Gabol 190 & Huile Corps to stimulate the skin. Specific aggressive kneading, percussion & effleurage manipulations are used to smooth away cellulite. Now the fabulous YonKa gauze (soaked in lavender, geranium, rosemary, cypress & thyme) is wrapped around entire body followed by the layered plastic & foil to complete the Body Wrap. See the video. After removing the entire Body Wrap, a beautiful finishing massage procedure is given with Huile Corps to provide a long lasting "glow" to your skin head-to-toe! Total treatment cost starting at $175, Gayle will explain when you call for your appt. REMINDER... best results if you have Gayle complete your waxing service about 2 days BEFORE you receive this "Firming Body Wrap".